Custom Car Flags fitted to plastic flagpole ready to insert into car window. Custom car flags are great promotional tools for sports teams, clubs, business services and brand recognition. Catch the eye of passersby with our high quality custom car flags. 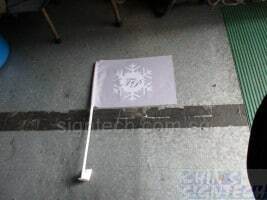 When you have this car flag attached to your windscreen, all other cars will move aside. Your car will be act as ambulance or Minister car. Your car outshine Ferrari, Porsche and Lamborghini ! Try it Out , you can feel the difference ! Digitally printed on knitted polyester fabric are A4 size (21 x 29.7cm) and come with a 45cm white tall plastic flagpole. 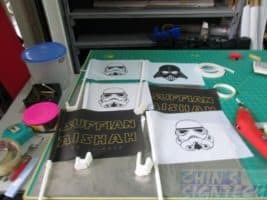 These custom car flags come with plastic or magnetic fittings, quick and easy fix onto your car.